About a year ago I floated the idea of running an internal game jam and got a lot of interest from not just the developers but from our business and support staff. Actually implementing that idea got waylaid by being too busy with development (we were on a very tight deadline revamping the hacking in EVE) and by my not really being senior enough to co-opt things like people and budget to help out. The idea was revived by my immediate manager Bjossi and along with a crack team of others interested in helping out we assembled what I think was the first Game Jam organized within CCP. Eating pizza at the end of day one. All game code and content must be made on the 14th and 15th of February. All games must be based on the theme of the jam. The theme will be announced at the beginning of the jam. There is no restriction on third party libraries or tools although you must only use software with a valid license (e.g. trial license). There is no restriction on preparation for the event so long as no content or game code is written prior to the theme being announced. Games may be digital or paper based. All digital games must run on Windows. We’re going to share source code internally as it can be a great learning tool. All IP created is the property of CCP Games. Teams shouldn’t really be larger that 6 members. Try to recruit of join up with people you don’t normally work with. Attempt to spread people that work on games directly during the day out between teams. If you have special requirements about when you can or can’t work just let your teams know. I hope most people will be glad of the extra pair of hands even for a short while. CCP very kindly gave us permission to run the Game Jam using one day from the working week and the use of the office facilities over the weekend. We also got budget to feed the troops pizza and beer after day one, for some beers to available during a showcase afterwards and for some free drinks at a local bar as an after-party for the participants. We also block booked out some of the meetings rooms in the office for the exclusive use of the teams and allowed people to work offsite, although only one team actually did. For communication before and during the Jam we had a couple of mailing lists setup and a chat-room open for all the participants. At the beginning of the work day on the Friday we announced the theme ‘One Heart to Break’ and after a bit of a false start everyone quickly formed up into teams and disappeared. I spent most of the day trying to make sure everyone had what they needed. There was a hard submission deadline of five PM on the Saturday evening which all the teams made, although some only just! After they submitted everyone rushed to get setup to demo their creation in a showcase open to the rest of the people from the office. Beer was consumed, fun was had and then each team gave a little presentation about their game before I announced the prize winners. After we’d packed up we all adjourned to the pub where the event was dissected in detail. 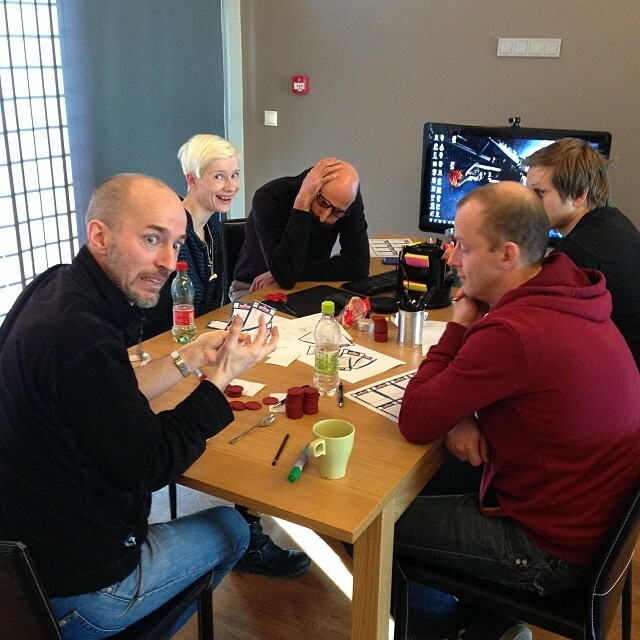 One of the teams looking a bit stressed out. 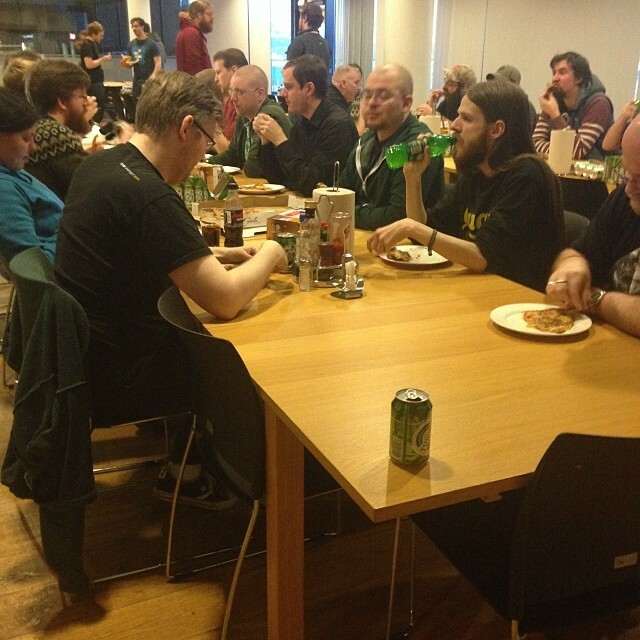 Game Jam’s are awesome, most people that have taken part in one will have enjoyed it. Ours was no exception and the event generated a tremendous amount of good will from the participants. At the beginning I was a little worried that teams wouldn’t end up making very much but every single team made at least one game. People did mix up who they worked with a little but most of the big organization boundaries weren’t crossed. I think that’s about all you can expect running this sort of event for the first time. I would like to make more of a thing out of the showcase when we do this again. The organization was a bit last minute and we could have done more to make the event something people wanted to attend as well as easier for the teams to setup and be distinct from one another. Over the next few days I’ll post about each of the prize winners before summing up the remaining entries.